On May 14, 1948, the state of Israel became a legal reality. Friday the 13th, 1988, marked the 40th anniversary of the final day of non-Jewish rule in Palestine. That should have led either to Armageddon or the Rapture, according to numerous proponents of dispensational premillennialism. Nothing happened. Forty years is an intriguing number of year, biblically speaking. It marks one biblical generation. It was this figure of 40 years that had led some dispensational leaders in the late 1970’s to forecast the Rapture in 1981: 40 years minus the seven years of Israel’s Great Tribulation, when the Church will be in heaven, according to pre-tribulational dispensationalism. But the Rapture did not take place in 1981, either. In early 1988, Mr. Edgar C. Whisenant published a back-to-back, two-part book. He used more than one title for one of these books, but one version was called The Rapture Rosh Hash Ana 1988 and 88 Reasons Why. 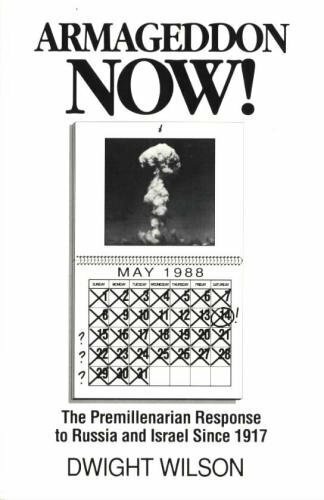 It predicted that the Rapture would take place in September, 1988. It sold millions of copies. But the Rapture was delayed. Again. Then he announced that he had forgotten that in between 1 B.C. and 1 A.D., there was a full year, so really the Rapture would come in September, 1989. It didn’t. We then heard no more from Mr. Whisenant. In August, 1990, Saddam Hussein’s forces invaded Kuwait. Immediately, there was a flurry of American fundamentalist interest in another wave of books on the revival of “Babylon.” Prophecy book sales soared far higher than Scud missiles. Iraq was expected to invade the nation of Israel. But nothing happened. Iraq lobbed a few Scud missiles into Tel Aviv. Most of them were shot down by U.S. Patriot surface-to-air missiles. Armageddon was delayed. Again.